Santa Fe has a rich history and culture that makes it one of the most diverse and interesting places to visit. Santa Fe is known as the “City Different” in the Land of Enchantment. We know that you will enjoy visiting the many attractions that Santa Fe has to offer. Because Inn of the Governors is situated in the heart of the city, you will easily find most activities, shopping and restaurants within walking distance of our Santa Fe hotel. We have provided many details about Santa Fe, and encourage you to use Guest Services to help you best plan your trip. 1050-1607 – Santa Fe occupied by Pueblo Indian Villages. 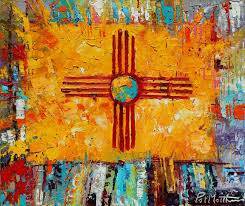 1540 – First claimed “Kingdom of New Mexico” for Spain by conquistador Don Francisco Vasques de Coronado. 1609 – Don Pedro de Peralta appointed second Governor-General of New Mexico and moved the capital to present day Santa Fe. 1607-1692 – Spanish soldiers and Franciscan missionaries tried to conquer and convert the Pueblo Indians. This resulted in an Indian revolt and most buildings were burned, except the Palace of the Governors. 1692-1821 – Santa Fe grew as a prosperous city. 1821-1846 – Santa Fe became the capital of the province of New Mexico, owned by Mexico, which gained independence from Spain. 1851 – Santa Fe underwent an economic revolution and the construction of St. Francis Cathedral began. 1914 – Mexico signed the Treaty of Guadalupe Hidalgo, giving New Mexico and California to the United States. State Question: Red or Green? (Refers to Chile) Or, maybe Christmas.